[SatNews] Airbus Defence and Space is expanding its services in Australia and the Pacific region in partnership with leading global satellite operator SES to provide reliable and secure satellite communications solutions to broadcast, telecom, corporate and government customers worldwide. The partnership will provide communications services via SES’ NSS-12 satellite and partner teleport. Mining and oil & gas customers in Australia and Pacific with operations in Africa will benefit from the new services because of lower latency on their communications. The footprint is further expanded by a stronger Airbus Defence and Space Sales team in the region, located in Perth. This footprint increase will greatly raise the value provided to Australian and Pacific companies operating in Africa, as the new communications HUB as well as most of Australian mining companies are located in Perth. Lower latency is of great importance for voice and enterprise resource planning applications used to transmitted back to Headquarters in Australia from mining operations in Africa. 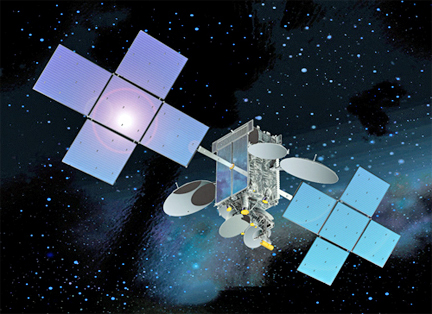 Artistic rendition of the SES-12 satellite. The new services terminating in Perth will be using state of the art technology provided by enhanced Terralink VSAT service based on nexgen satellite communications technologies. Terralink is the latest innovation that has come out of the AuroraGlobal multi-band portfolio ensuring customers with the most stable and future proof connectivity. This advanced technology combined with Airbus Defence and Space’ and SES local presence will provide a robust cost-efficient service in the region, additionally it will reduce latency. “We follow the market trends and listen to our evolving customers’ demands. That’s why we see our development in Australia and the Pacific region as a strategic step. We will provide mining and oil & gas customers with a connectivity service that not only meets the communications requirements of today, but also of tomorrow, in a competitive and highly efficient way”, said Danny Côté, Head of Enterprise Satellite Communications, Airbus Defence and Space. "Airbus and SES have been providing services to the mining and oil & gas industry across North America, and we are pleased to further collaborate and strengthen our long-term relationship with Airbus in this part of the world. Strong local presence of SES teams in Africa and Australia means that we grasp the unique market situations thoroughly, enabling us to react quickly in providing tailored and flexible solutions for the end-customers," said Simon Gatty Saunt, Vice President of Data & Mobility services at SES. Airbus Defence and Space has a successful track record in Africa and benefits from a trusted network of local partners as well as a regional office based in Tanzania serving Enterprises requiring a stable IP connectivity where traditional terrestrial networks are unavailable. The addition of the new platform in Australia strengthens the service to companies operating in these regions and provides the foundation for expansion in the Pacific region.